Photograph of the construction of the pavilion. 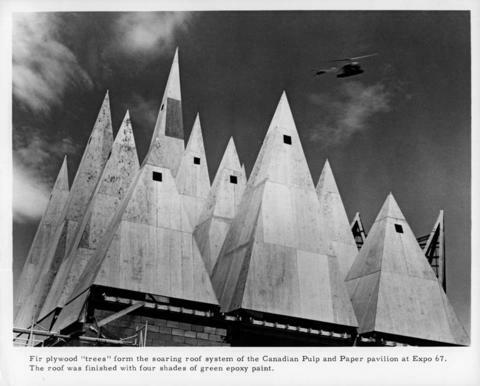 A caption typed in the margin of the photograph reads "Fir plywood 'trees' form the soaring roof system of the Canadian Pulp and Paper pavilion at Expo 67. The roof was finished with four shades of green epoxy paint." Collins, Piter. "Expo-and After." Canadian architect, 1966 Oct., v. 11, p.73.